Looking for the ultimate fifth wheel for your whole family to enjoy their own space when inside? 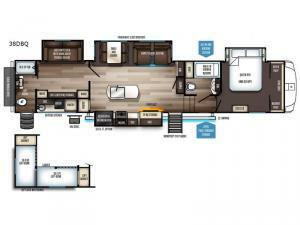 This Sabre not only offers two full bathrooms, dual entry into the unit, and a private front bedroom, you will also find a private bunkhouse for the kids or overnight guests, and a loft area which sleeps two campers. You are sure to love the home theatre seats with cupholders and free standing dinette while watching the large residential size LED TV with a remote controlled fireplace below. The cook can make meals inside with full kitchen amenities including an island and residential refrigerator or prepare a meal outdoors on the outside kitchen on the counter with a refrigerator, storage and a sink. This is the one!